You'll fall in love with soft, chewy, salt, butterscotch, salted butterscotch, chipotle, salted chocolate, green apple, and salted mocha caramels. A great way to try all of the flavors this artisan producer in Montana has to offer. Bag tied with a pretty purple bow. Ingredients: Brown sugar, tapioca syrup, heavy cream, butter, sugar, (chocolate and salted mocha caramel contain unsweetened chocolate), fructose, milk, sugar, non-GMO natural flavor (pure vanilla extract), (cinnamon caramel contains ground cinnamon), (all salt caramel contains sea salt), (espresso and salted mocha caramel contains coffee), (chipotle caramel contains chipotle), (mint caramel contains peppermint oil), salt. **12g fat in chocolate and salt-chocolate caramels. ***30mg choloesterol in all chocolate and salted mocha caramels. ****300mg sodium in all salt caramels. Delicious! More flavor than the stuff they pass off as caramel at the grocery store. The variety bag comes with two of each flavor, so both my kid and I were able to get a test of each flavor. I was not a fan of the green apple or chipotle, but the others were delicious. The mint was both my kid's and my favorite! 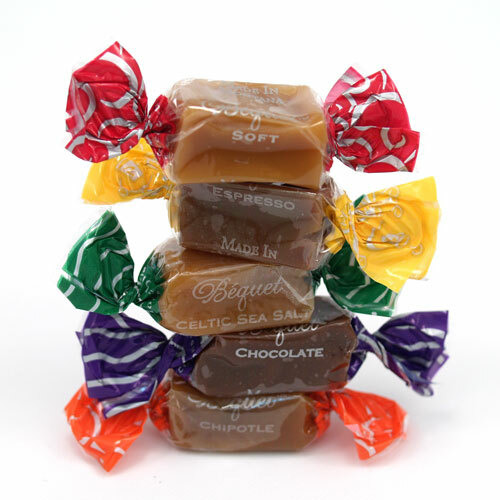 These caramels, especially the Celtic Salt are the best caramels I've ever eaten. They are soft and buttery, the flavor accented by the salt. They are delicious. Get it out of my mouth!! Buttery, rich, delicious, homemade flavor. What more can I say. These are simply the best. A great gift or keep them all to yourself. It is hard to pick a favorite because they are all great but the Celtic sea salt is the first one I would grab for out of a mix. You cannot believe how good these are till you try them. I have a house full of allergic kiddos, so I purchased these along with some other items for Christmas stockings. These didn't make it to the stockings. My husband and I ate most of them!! The chipotle is so super yum that my husband, the pickiest candy man in the world, loved them. These are big pieces, too, easily two bites!! Well worth the money! I'm buying more for Valentine's Day. Best Carmels in the world! My friend who received your carmels when her family from Montana came to visit her for Christmas gave me two of them today, and I discovered the best carmels in the world! They are so very delicious, plan to order some from you soon by mail. Thank you for your wonderful carmels!